Little has been published about challenges with medication reconciliation in the community setting or conversations with stakeholders beyond the acute care setting. 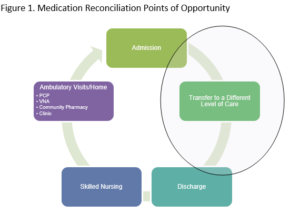 It was clear that the community setting and transitions across “downstream” providers offer unique opportunities and challenges to conducting medication reconciliation. As the collaborative began to share their challenges, it was discovered that there was not a common definition of the core elements of medication reconciliation. While it begins with a complete medication history; there is also a requirement beyond documenting the medication list, a responsibility to clarify any medication-related concerns that are identified. 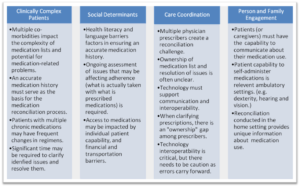 The Collaborative members agreed with the consensus of the 2012 report, Improving Care Transitions: Optimizing Medication Reconciliation, that this information must be “used within and across the continuum of care to ensure safe and effective medication use.” Figure 1 reflects the expanded care transition spectrum where medication reconciliation should be routinely conducted for high risk patients. 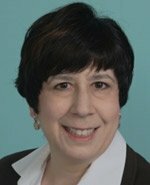 Historically, the focus on medication reconciliation has been for transitions to and from acute care settings. After their first full year of implementation, the E3 Collaborative participants identified that improving medication reconciliation is a significant opportunity to improve the success of their care transition programs and thus, improve patient care. They also identified several considerations that need to be addressed when implementing care transition programs (Figure 2). These considerations fall into four main categories: issues unique to medically complex patients, most with chronic illness; social determinants of health; care coordination; and person and family engagement. As organizations and payers move toward value-based payment reforms and population health management, the perspective on medication reconciliation needs to become more patient-centric and expand its reach into the community and home. Medication reconciliation processes should be implemented across care transitions and applicable to all settings. These processes should support a “culture of collaboration” that extends to downstream organizations (e.g. nursing homes and home health organizations) as well as individual providers (nurses, pharmacists in the community, and physicians). Such collaborations will ensure timely and responsive access to information and support provider conversations to resolve any issues identified; and by extension, optimize population health outcomes and value-based care delivery. It is important to develop medication reconciliation processes that are patient-centric and that address these considerations identified by the E3 Learning Collaborative.